If you are a new cat or kitten owner, you probably have a lot of questions about caring for your new friend. As you may already know or will soon find out, cats are so many things: fun, playful, independent, loving, curious, smart, and often very entertaining. Since you’re online seeking information about cat care, your pet is lucky to have a caring owner. Cats are easy pets to care for and relatively low-maintenance. Once you’re familiar with the basics of feeding, litter boxes, grooming, general health, and safety, all you have to do is love and enjoy your cat. 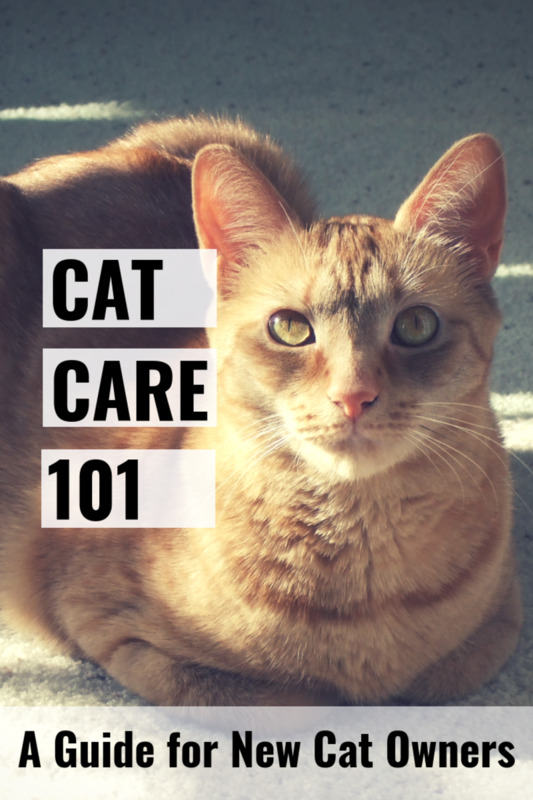 In Cat Care 101, you'll learn about the essential topics new cat owners should become familiar with to have a happy and healthy pet. You'll also learn helpful cat care tips and advice from a long time cat owner. We’ll start with the topic your cat probably thinks is the most important. The food you choose has a big effect on your cat's overall health, so you’ll want to make sure you’re feeding him or her something nutritious. If you know the brand of food your cat was eating prior to adopting it, it helps to get a small amount of the same food to keep him on a consistent diet and make a slow transition to whatever food you plan on feeding him. Changing to a new food takes a little adjustment and a slow transition can prevent stomach upset. Kittens (under one year old) should eat a kitten formula because they’re still growing and need a higher calorie diet. If your cat has health issues or is overweight, underweight, or is a senior, it’s best to let your veterinarian help you select the right food. For example, if your cat needs to lose weight, this needs to be done slowly for health reasons. For the average, healthy cat or kitten, here's a quick breakdown of the types of food you’ll find in the grocery store or pet store. Most cats like canned food, also called ‘wet food’, once they get used to it. The high water content in this type of food provides additional hydration. Canned food comes in a variety of textures, like chunks, slices, minced pieces, pâté, or chunks in gravy. Some cats will eat anything, and others have specific preferences. If you need to, try different types to see what your pet likes best. There are big differences in the quality of foods, so be sure to read ingredient label before buying. Look for foods with meat as the first ingredient, rather than grains or fillers. Felines are carnivores by nature and have little need for grains in their diet. 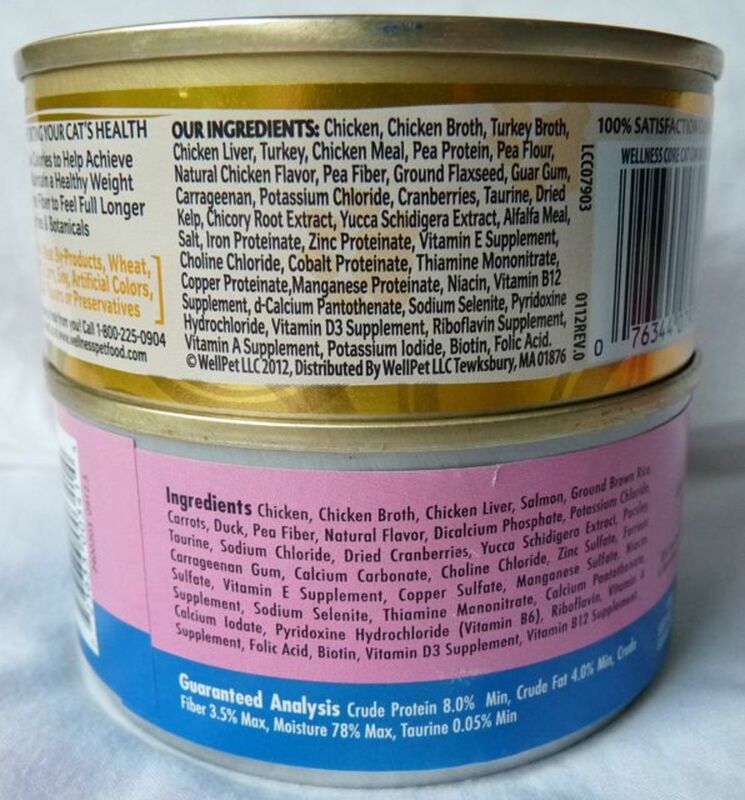 Better quality and premium canned foods often have meat (poultry, beef, fish, etc.) as the first several ingredients and don’t contain by-products, artificial colors, flavors, or fillers. You can find these foods at most pet food stores and online. Although they tend to be more expensive than grocery store foods, pure ingredients and less fillers means there’s more nutrition packed into one can. Feeding a high quality food can contribute to better health and fewer trips to the vet. My suggestion is to buy the best quality canned food your budget allows. There are resources online to help you choose the best type of food. For more in-depth information, see my article: How to Choose the Best Cat Food for Your Cat. Wet food shouldn't be left out longer than a half hour (twenty minutes in hot weather) because it can spoil and become unsafe to eat. Cover and refrigerate leftover food in the can and throw out uneaten food in the bowl. Cats should eat cat food to be healthy. Dog food or even a can of tuna doesn’t provide complete nutrition. Some people prefer feeding dry food or a combination of wet and dry. Dry is convenient if you're not home during the day because it can be left out without spoiling. 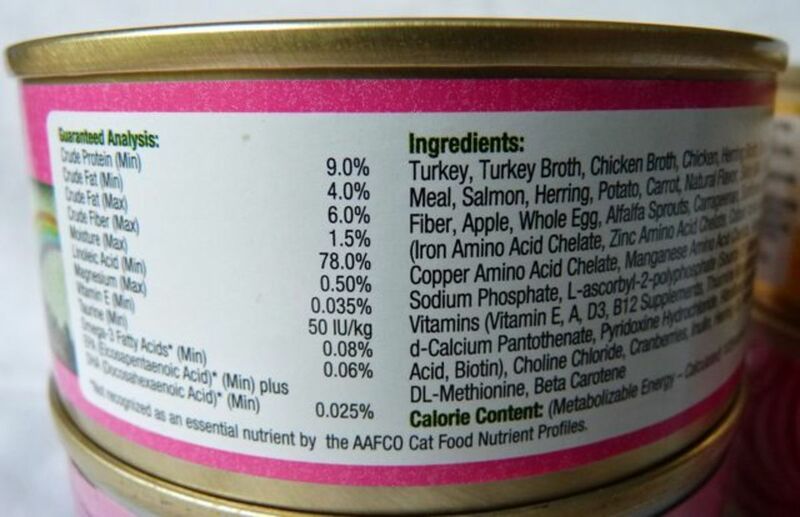 As with canned food, read the ingredient label and look for brands with meat in the first few ingredients. Try to avoid products with by-products, fillers, and artificial flavors. Tip: Only buy a small bag of a new food until you're sure your cat likes it. This depends on his or her weight and activity level. 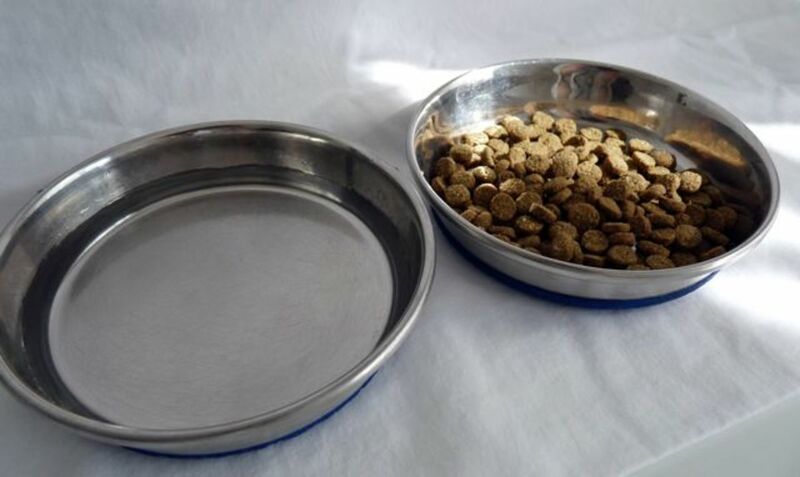 Either follow the suggested portion size on the food packaging or get a recommendation from your vet. 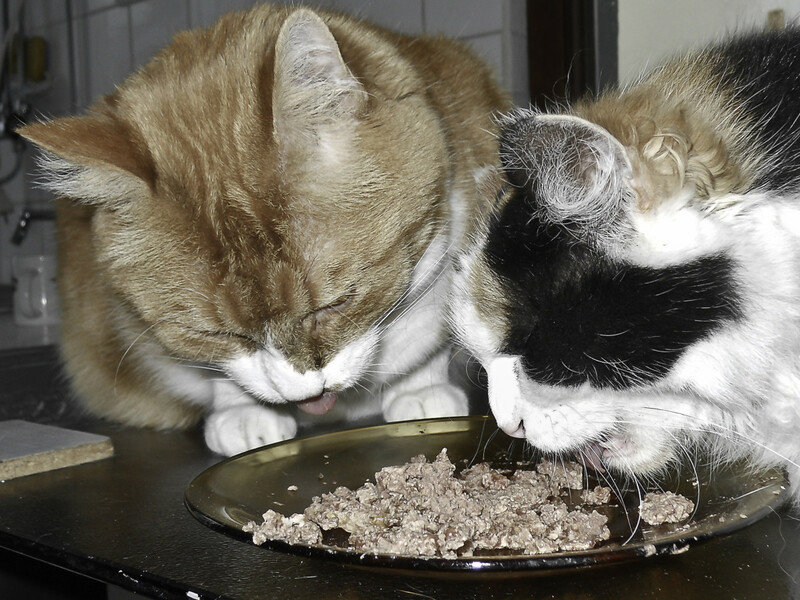 If you’re feeding both dry and wet food, take that into account when figuring out how much to feed. If you have an adult cat that seems to be gaining weight, reduce the portion size or switch to a reduced calorie or ‘indoor' formula. For food and water, stainless steel and ceramic dishes and bowls are ideal. Unlike plastic, they don't hold odors and are easy to thoroughly clean. It's a good idea to have more than one dish and bowl so you always have a clean one available. I like DuraPet Cat Dishes for feeding because they're shallow, which makes them easy for cats to eat from. They have a rubber ring around the base, so the dishes don't get pushed around the floor as the cat eats. Keep a bowl of water in a location your cat can access at all times. Cats love fresh water, so change it at least once a day and wash the bowl with warm, sudsy water at least a few times a week. 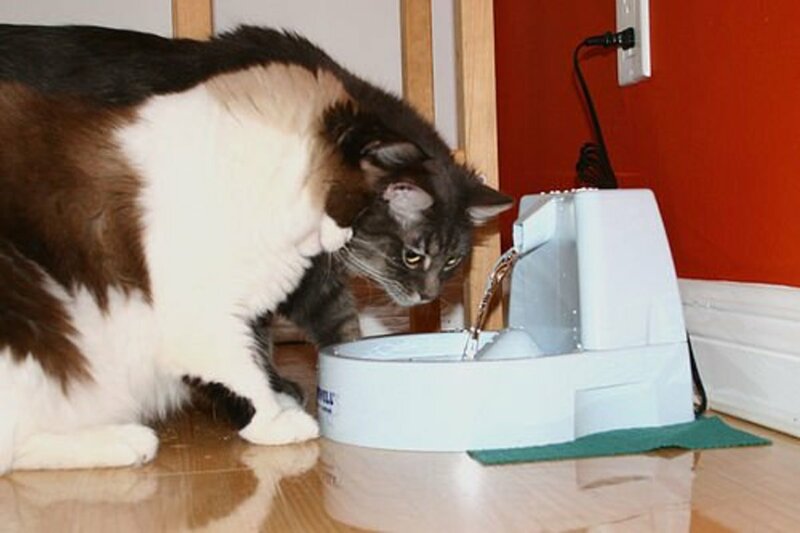 Tip: To encourage more water consumption, keep a water bowl in two locations. You'll need at least one litter box for each cat you have. Mine like the standard open style boxes. Covered boxes can trap odors or make some cats feel confined. Whatever type of box you choose, make sure it’s large enough. Smaller boxes are fine for kittens, but cats over 10 or 11 pounds may find a regular size box too small. Choose an extra large one if needed. There are many types of litter to choose from: clay, clumping, pine pellets, corn and recycled newspaper litter, just to name a few. If you're not sure what kind to choose, start with a basic clay litter. This is usually the least expensive and most cats and kittens are used to it. Look for 'low dust' or 'no dust' varieties because dust isn't pleasant for your or your pet. Tip: Once you find a type and brand of litter that works, stick with it. Switching litter types too often might cause finicky cats to avoid the box. Choose a scoop that works with the type of litter you buy, and a small bucket to dispose of dirty litter as you scoop. If you keep a mat under the box, it'll help catch litter before it gets tracked around the house. Scoop once or twice a day to keep the box clean for your friend. About once a week, replace all the litter and wash the box with dish detergent and warm water. It may be gross, but check for anything unusual in their stool or urine (such as worms, mucus, or blood). Also, notice if there is diarrhea, hard stools, or more or less than usual. If you see anything that doesn’t seem normal, call your vet to ask about it. If you'd like some insight on how to prevent litter box issues, check out my article: Cat Not Using Litter Box? Try These Solutions. Brushing is easy and doesn't take too much time. Most cats enjoy being brushed because it relaxes them. Regular brushing removes dead hair, dirt, and helps keep the skin healthy. Short or medium-haired breeds should be brushed about once a week. Those with longer hair, like a Persian or Ragdoll, should be brushed two or three times per week. A regular bristle brush works fine for most cats. 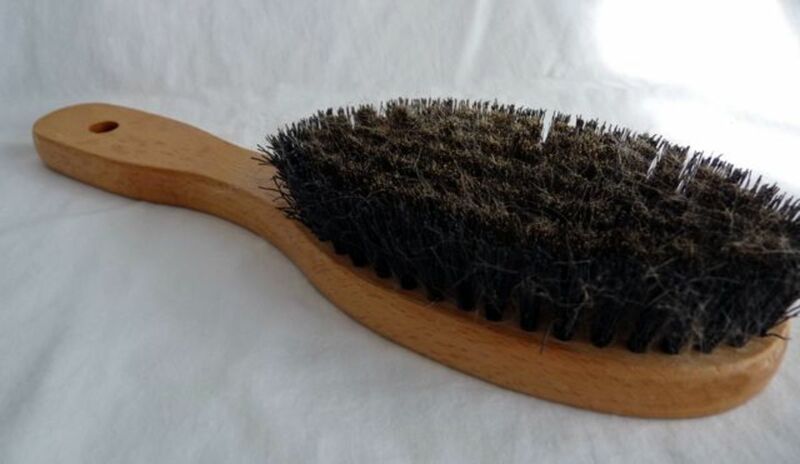 You can also use a brush with metal bristles to remove more hair if your pet sheds a lot. If you’re in a pet store and not sure what type of brush to get, ask the staff to recommend one. Mats are hard clumps of fur that form if the coat isn’t brushed often enough. Shedding increases as the weather warms up, so brushing is important to remove dead hair and prevent mats. Mats can form on cats of any hair length, but are more common with medium and long-haired breeds. Once they form, they’re difficult to comb out. You might need a professional groomer or vet to remove them or shave them off if they're severe enough. To avoid this problem, use a brush regularly. If your cat sheds a lot or has the type of coat that's prone to mats, consider using a FURminator occasionally, in addition to a regular brush. This special metal tool removes more hair than a standard brush. It's available in two sizes and there are versions for both short and long-haired breeds. 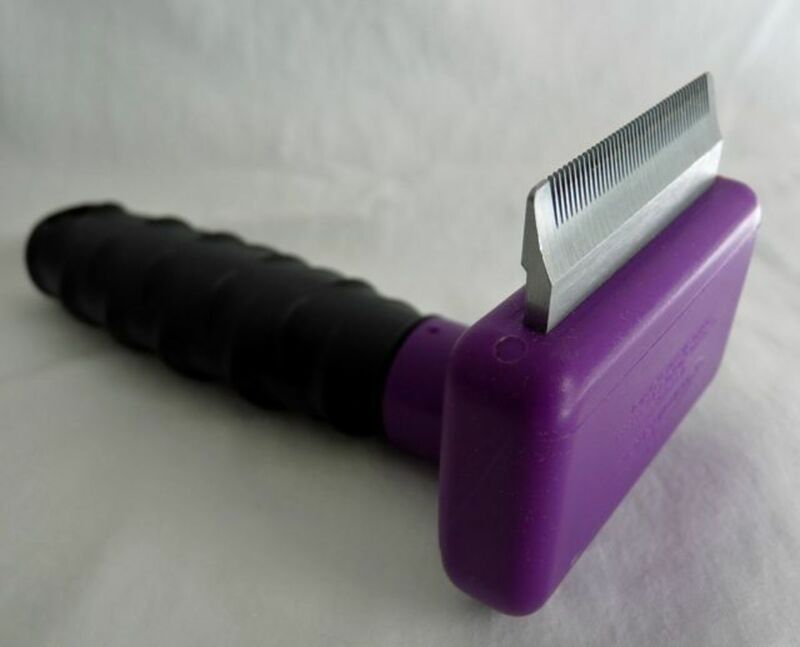 Note: This tool can remove a lot of hair, so use it gently and don't over-do it. Most cats do a good job of keeping themselves clean. Unless they're dirty from being outdoors or older and not cleaning themselves well, one or two baths a year is usually enough. Use a gentle shampoo designed for cats and avoid getting soap or water anywhere near their eyes or ears. Avoid shampoos with flea treatments (unless your vet recommends it) as many cats have had bad reactions to certain flea treatment shampoos. After bathing, use a towel to dry him well, then keep him someplace warm until he's dry. Once the coat is fully dry, a good brushing will make him fluffy and beautiful. 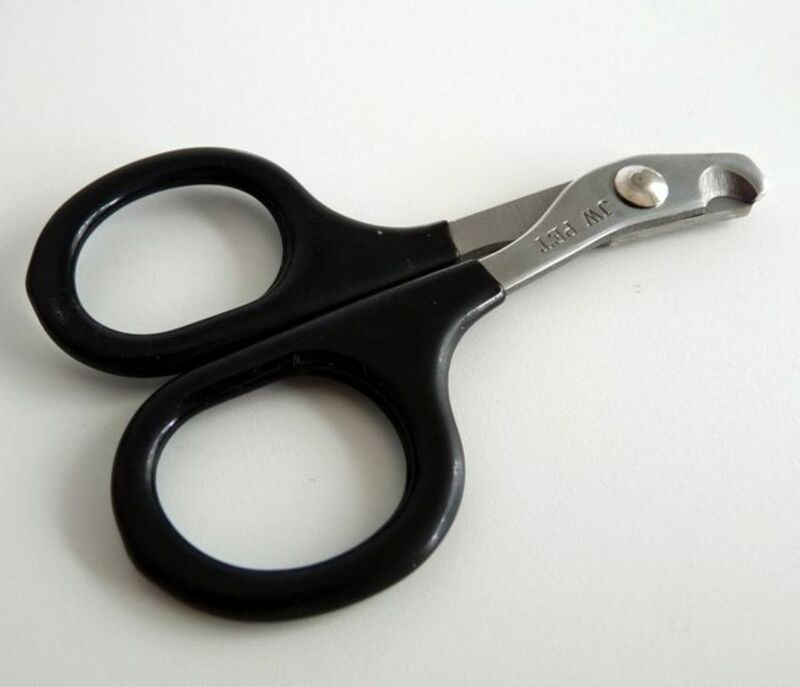 You'll need a small pair of cat scissors to trim your cat’s claws. Trimming is important to keep claws from getting too long, sharp, broken or frayed. Long claws can cause your pet to accidentally scratch you when you’re holding him, or snag your clothing or furniture. Be sure the scissors you use are sharp. Once they're dull, they tear the claw instead of cutting and this is painful for the cat. If you've never trimmed a cat's claws before, it's a good idea to have an experienced cat owner, a professional groomer, or your vet demonstrate how to do this properly until you're comfortable trying on your own. Choose a well-lit or sunny room. Find someone to hold the cat still unless you can do it yourself. Set your pet on a table, your lap, or the floor. Whatever works best for you. For front paws, press gently on one toe until the claw extends out. Locate the ‘quick’, which is the pinkish vein that extends down through the nail. Trim only the tip of the claw. Do not get close to the quick. Repeat this with each toe, including the ‘dew claws’, which are on the inner part of their front legs by their wrist. Keep a small container of pet styptic powder on hand in case you accidentally cut the quick. If this happens, put styptic powder on the nail and put pressure on it with a paper towel to make sure the bleeding stops. As long as you’re very careful and do not get near the quick, this shouldn't happen. Some cats are better about having their claws cut than others. My cats are much more accepting of having their front claws trimmed than their back. If you start this habit early on, he or she will get used to it more easily. Use plenty of praise and a couple treats afterwards to make the experience positive. Cats and kittens love their playtime, so get a few types of toys to keep them entertained. Cats can have specific toy preferences, so if you get one he doesn't like, keep trying until you find something he does. One of my cats loves mice toys that he can carry around in his mouth. He’ll actually play fetch like a dog when I toss his favorite toy around. My other guy is more amused by colorful plastic spring toys. He’ll have fun batting them across the floor until he wears himself out. 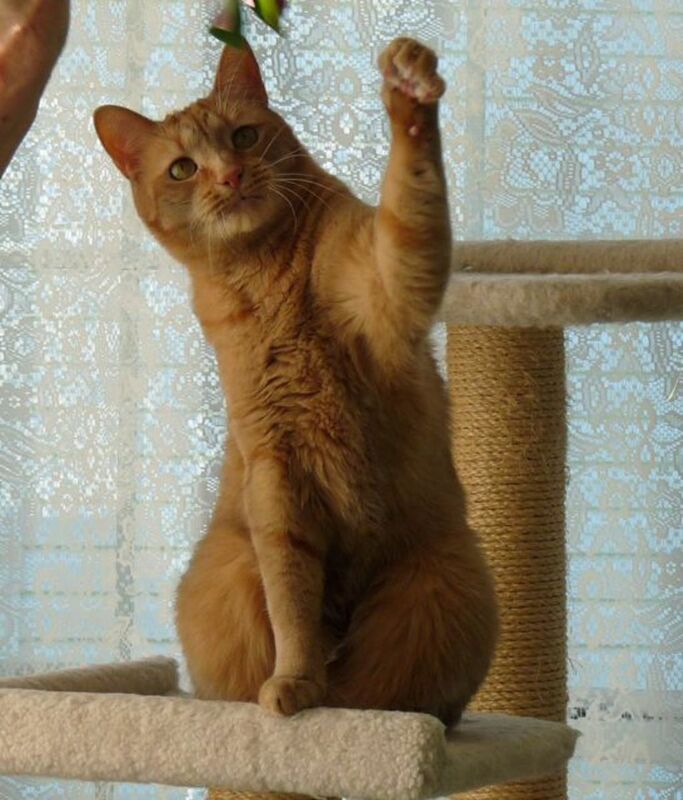 If your cat is lazy and needs some encouragement to get moving, try ‘Da Bird’, which is a long wand with feathers on the end of a string, which mimic a bird in flight when you swing it around. 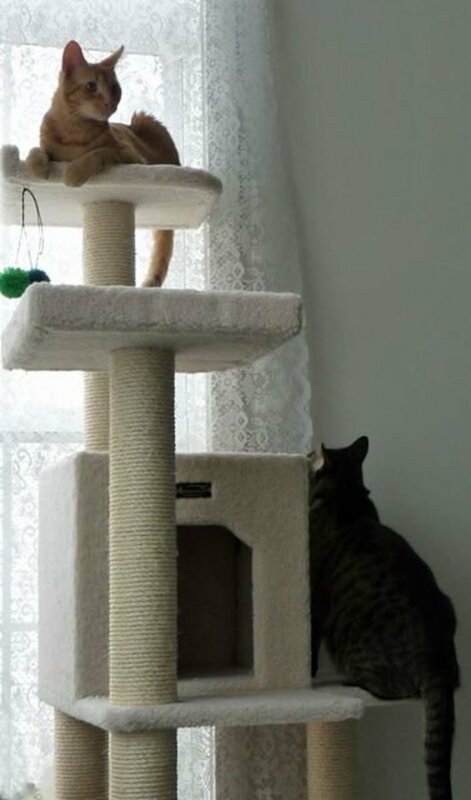 Even the laziest cat usually can’t resist taking some swats at it or chasing it around. 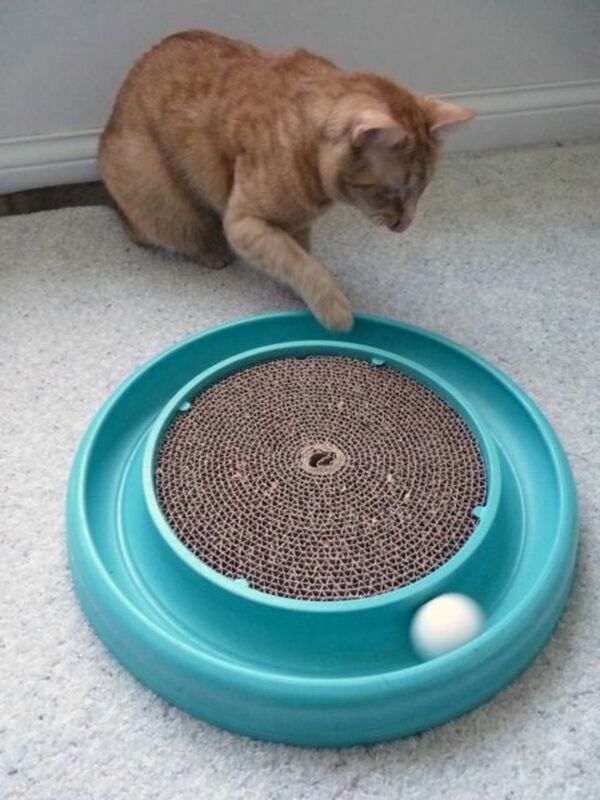 The Bergen TurboScratcher is another fun toy where cats can push a ball around a circle and use the corrugated cardboard center as a place to scratch. To prevent claw marks on your furniture, place a scratcher in a few places around the home. These could be scratching posts, scratching pads or a corrugated cardboard scratcher. They don’t have to be fancy. 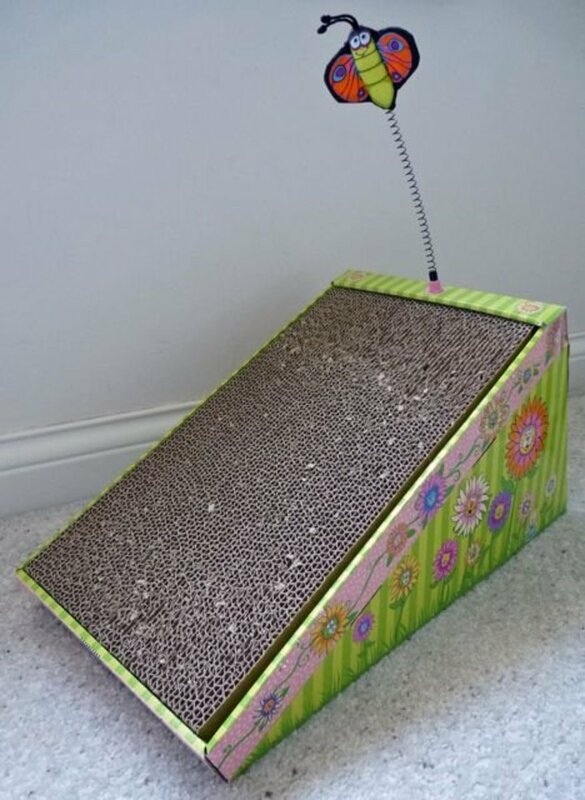 One of my cats loves scratching on anything made out of corrugated cardboard and this type of scratcher is very inexpensive. You can also buy a small container of dried catnip to sprinkle on the scratcher to attract your cat. Whenever he uses the scratcher, praise him so he learns to use the scratcher and not the corners of your couch. 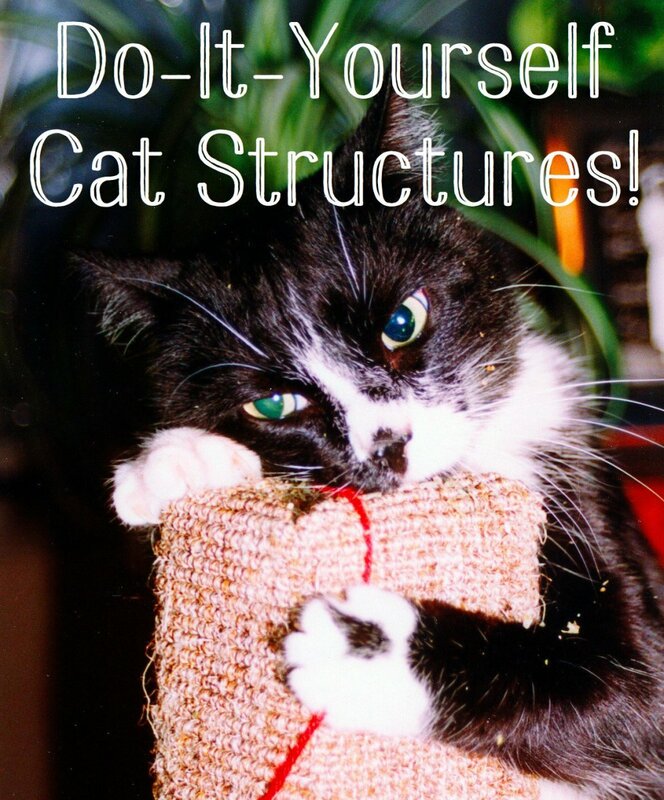 For more tips on scratching, see my article: How to Stop Cats From Scratching Furniture. 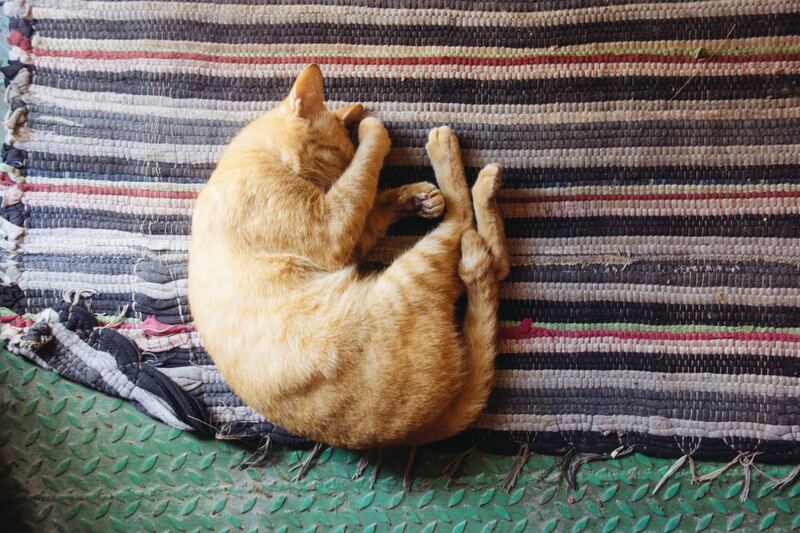 Most cats sleep a lot during the day, so give yours a comfortable place to rest. This could be a cozy cat bed or just a soft blanket of his own. Some prefer sunny, warm spots to sleep; others want to hide away in someplace dark and private. Notice where your pet sleeps most often and put the bed in that area. It’s good to keep a bag of treats around to reward your cat. 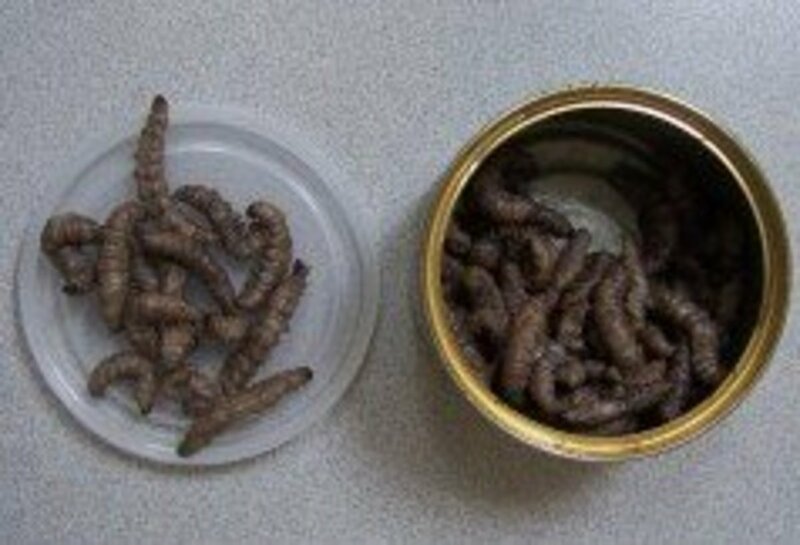 Look for these wherever you buy cat food. 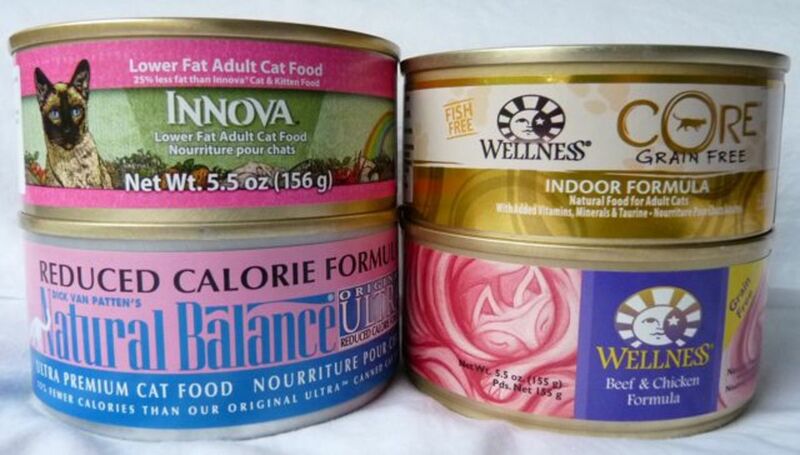 There are many flavors to choose from: chicken, fish, beef, cheese, salmon, tartar control and even catnip. 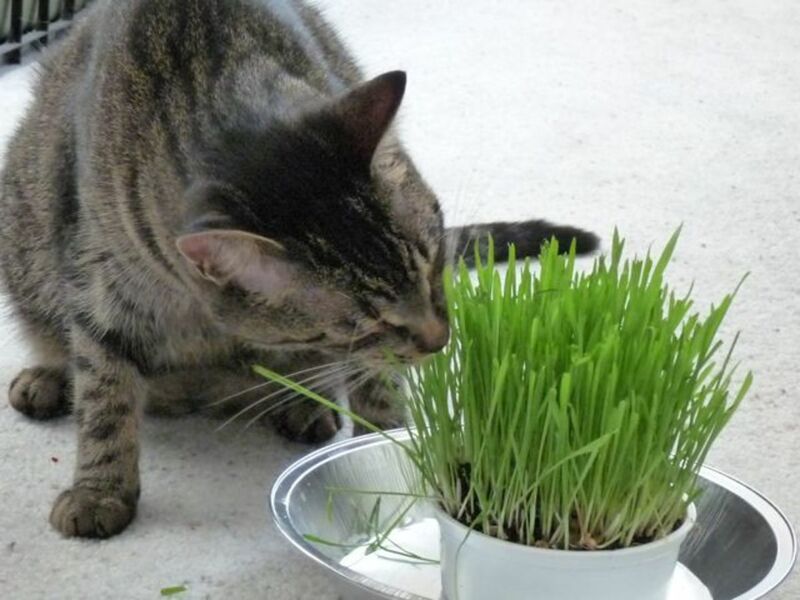 Many cats love fresh cat grass. 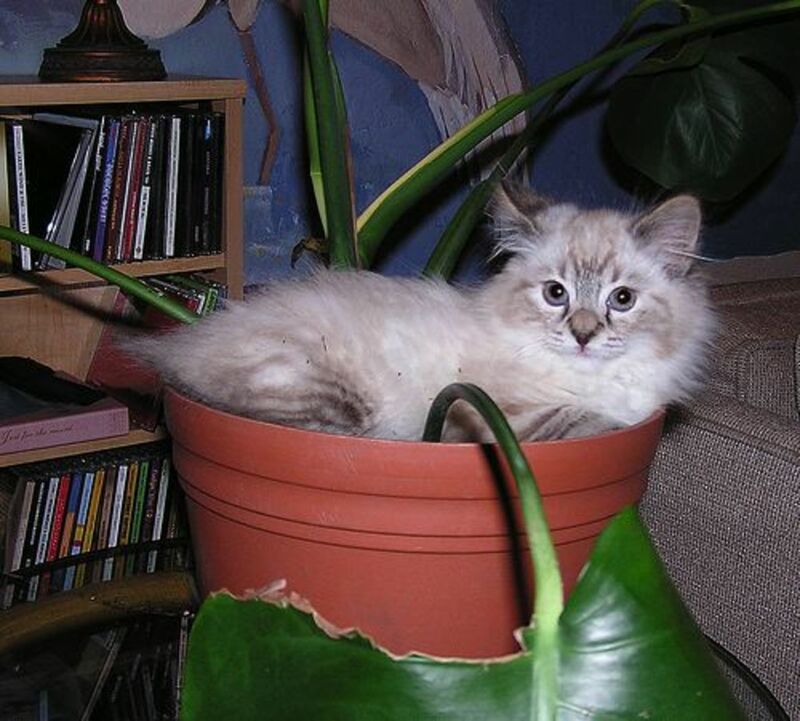 This can be found at some pet or health food stores, or you can purchase a kit and grow it yourself. It takes just a few days to grow, and it's fun watching your pet enjoy it. Catnip comes dried in containers or bags. You can also buy a container of freshly grown organic catnip at some pet or heath food stores. Not all cats react to this herb, but the ones who do will act strange when they eat it. Some will roll around in it. Others will act drunk and fall asleep. Sometimes they get hyper and more playful than usual. Catnip can cause some cats to become aggressive or fight with another cat, so be cautious until you know how your pet reacts to it. Carriers are essential for vet visits, travel, or in case you ever need to leave your home in an emergency. They come in many sizes and price ranges. Look for one that gives your cat enough room to fit comfortably with some room on each side to move around. 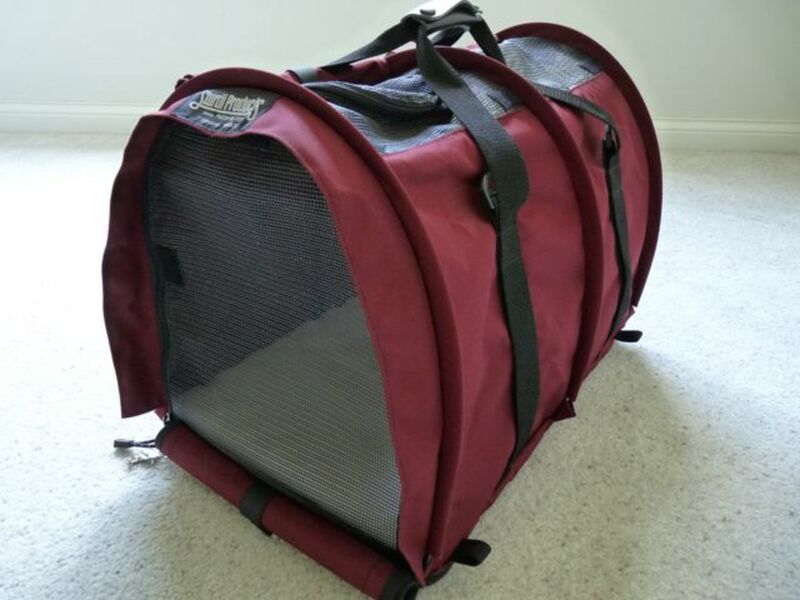 For large cats, find a large or extra-large carrier or a dog carrier. To learn more about choosing a carrier, see my article: Best Cat Carriers. Do You Brush Your Cat's Teeth? It may seem strange to brush a cat’s teeth, but it’s something you should do to prevent all sorts of health problems caused by poor dental health. Bad teeth, plaque, and gingivitis can cause bacteria in the mouth that can affect major organs such as the liver, kidneys, and heart, causing serious health problems. If you start brushing from the start, you can prevent these problems. All you need is a cat tooth brush kit, available in pet stores or your vet’s office. Note: Toothpaste for humans is unsafe for cats. Cat tooth brush kits usually include a rubber brush that looks like a thimble, a small toothbrush, and an enzymatic toothpaste. It might take some time for both you and your cat to get used to teeth brushing, but after a little practice, it’ll get easier. Tip: You can also ask your vet about a drinking water additive that helps prevent plaque formation. If you don’t already have a veterinarian for other pets, talk with people you know for suggestions of good vets in your area. You may want to meet the vet first to make sure they have good credentials, are competent, knowledgeable, and charge reasonable prices. Also, look for someone near your home and easy to get to in case of an emergency. Your vet will advise you about how often your cat or kitten needs to be seen for check-ups and vaccinations. Bring a list of questions you may have about your pet and its health. Your vet is a valuable ally in keeping your new friend healthy. 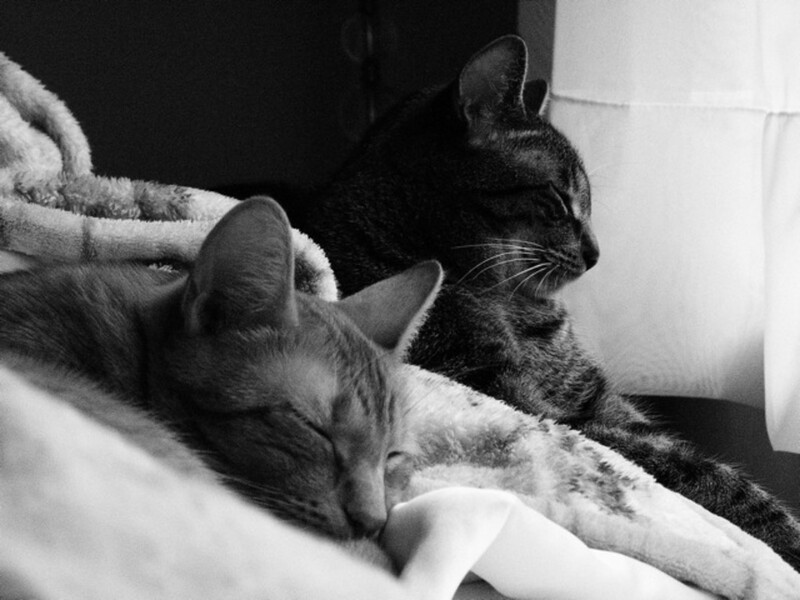 As long as they're well cared for, felines can live long, healthy lives. A nutritious diet and regular veterinary care can prevent many health problems. Cats can be very good at hiding signs of illness, so watch for any changes in their eating, drinking, litter box habits, or activity level. Ask your vet about any concerns to be safe. If you have young children in the home, teach them how to treat your cat with care and respect. Some children may not know that they shouldn’t pull a cat’s tail or play with it too roughly. Teach them how to gently pet the cat and to give it its space when it’s eating or resting. Look around your home to see if there's anything that could be dangerous to your cat or kitten. Cats are extremely curious and love to explore, climb, and pick up small objects in their mouths to carry around. Certain cat toys. Some toys are labeled "Use Only Under Supervision". 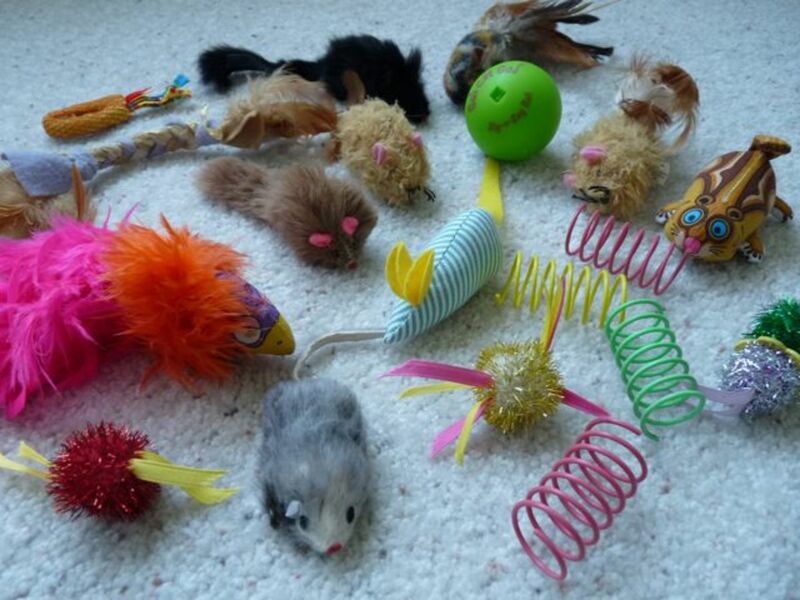 If you have any of these, store them somewhere inaccessible to your pet when you're not playing with him. Also be careful with very small toys or small mice toys. Always keep medications in their bottles and out of your cat's reach. 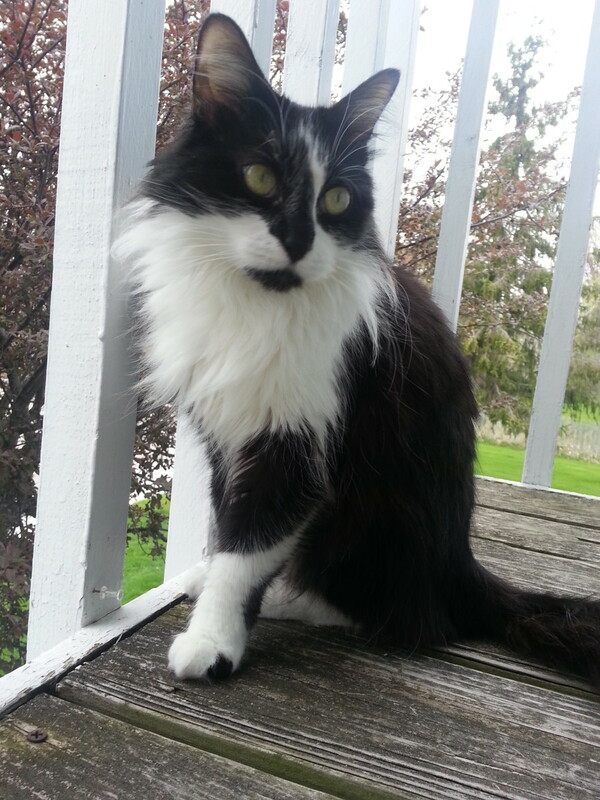 Remember that he or she can jump onto countertops and even get inside cabinets. Ingesting medicines can be fatal, so be extra careful not to drop any type of pill or spill medicines on your floor. 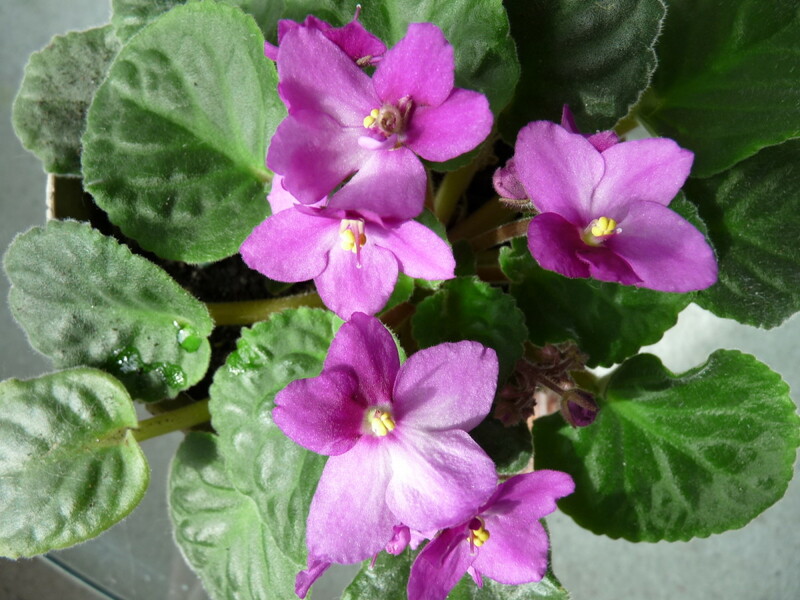 For information about cat-safe houseplants and flowers, see my article: How to Choose Cat-Friendly Plants. If your cat ever eats or drinks something that might be harmful, immediately contact your vet or the ASPCA’s 24-hour/365 day-a-year Pet Poison Control Hotline at 1-888-426-4435 (in the USA). There is a fee for this service, but if your vet isn’t available, this hotline could save your cat’s life. In general, indoor-only cats live longer and healthier lives. 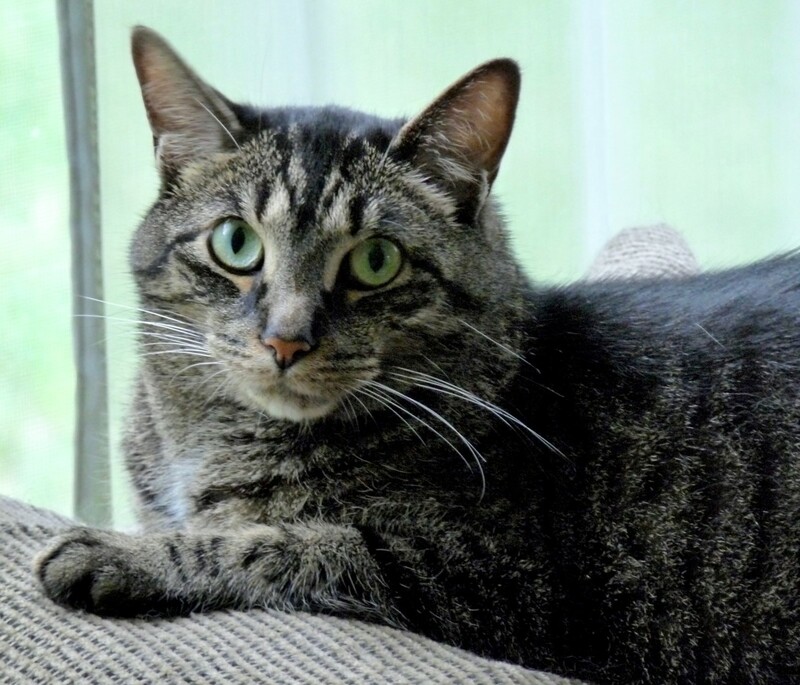 Cats that live primarily outdoors or both indoors and outdoors are subjected to risks like diseases from other cats or wild animals, vehicle traffic, dog or wild animal attacks, or getting lost or stolen. Keeping your cat indoors is a way to keep him or her safe and healthy. Congratulations on Being a First-Time Cat Owner! I hope you’ve found this cat care guide helpful and enjoy having a feline friend in your life as much as I do. My male cat has not been taking care of himself after using the litter box. I need to clean him up. Can I use baby wipes? I do not think lukewarm water and a washcloth is effective enough. Please let me know which product or procedure is the best. I would hate it if I used something irritating, making him uncomfortable. Baby wipes should be okay if they're a gentle formula, ideally unscented and hypoallergenic, but they do have wipes for this purpose at most pet stores. One is called "Well & Good Deodorizing Paw and Bum Cat Wipes," and there are some by the brand "Earthbath" and another called "Pogi's Grooming Wipes" that are hypoallergenic and fragrance-free or lightly scented. If your cat has medium or long hair, a groomer can make the coat shorter in these areas which makes it easier to clean and reduces odors. If you haven't already, you might want to check with your vet because when a cat isn't cleaning up after himself, it could be a sign of illness. My cat had some teeth taken out and her mouth hurts her a lot. What should I do? I suggest calling your vet for advice on this. They will be able to give you the best opinion and know how to help her. How often should I feed my 9 pound, active, indoor/outdoor cat if I want to feed her 3 times a day. Two dry and one wet? Yes, feeding three times a day is good for an active cat. Dry or wet food is up to you and your cat's preference. Just be sure not to leave uneaten wet food out for more than thirty minutes (twenty in summer). You can also mix a little wet with dry food for variety. My cat has mats in her fur. If I take her to the vet to get her shaved, she will freak out, as she is not used to humans. What shall I do? I would tell the vet about how she is, and they can advise you what to do. She might need some medication to calm her down before you bring her in. Once she's there, they will know how to keep her calm and comfortable while she's being groomed. Hi guys, I have a medium long haired cat who I adopted about a month ago. She needs regular brushing but she hates it. Her previous owner showed me how she usualy brushes her and she was brutal! She held her down by force and ripped her coat! Now her hair is dry, damaged and clumps up. Been trying to show her that brushing is actually a good thing, been gentle and patient and used loads of treats, affection and catnip, but she is still running away as soon as she sees the brush. Please help me, I would like to show her that brushing is a good thing but I've failed miserably and could use some tips on how to do it. Thank you in advance! As much as I am jealous of your hubs I must say you are very informative about cats and had I seen your pages before I created mine I would have been in heaven. I went through a lot of time and effort finding this information and appreciate all that you do for cats! Nice informative hub. 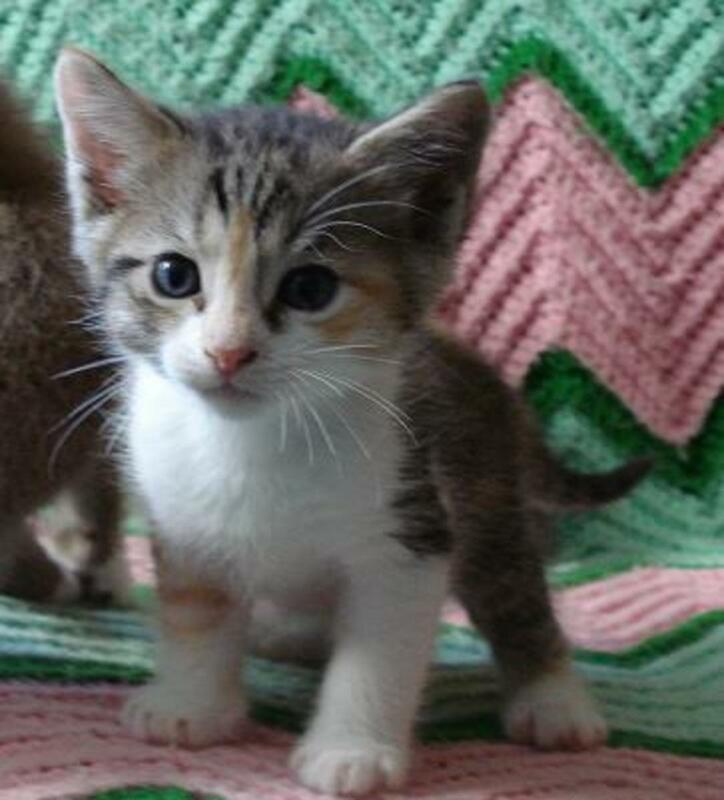 I might just say that kittens can get their first set of vaccinations when they are six to eight weeks old and should get fixed around four months. Voted up and shared.